Pleiades Star Cluster: Multiple exposures are made to collect enough light for an image that would otherwise not be evident to the eye. This image of a stunning star cluster seems to resemble old friends sitting in a circle. 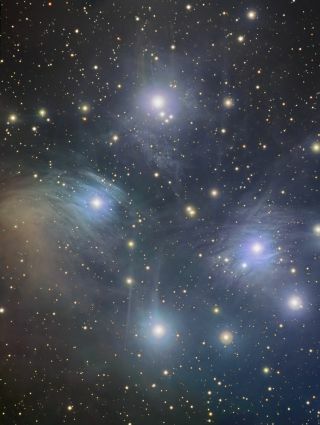 The celestial object, officially known as M45, is an open star cluster often called the Pleiades. The Pleiades star cluster is a group of 800 stars, formed about 100 million years ago and located 410 light-years away from Earth in the constellation Taurus. A light-year is the distance light travels in one year, or about 6 trillion miles (10 trillion kilometers). One of the brightest stars in the cluster is called Atlas. This star, along with its companion Pleione and their seven daughter stars, make up what we can typically see with the naked eye. The brightest stars glow a hot blue and formed within the last 100 million years. This means they are extremely luminous and burn out quickly. Scientists estimate these stars will survive for more than 200 million years before they die out. This image was taken by avid astrophotographer Bill Snyder from his home observatory in Connellsville, Pennsylvania on Dec.18, 2010.